A planned 31km day which should have now been a little shorter after the new windfarm had pushed me on a couple of extra km the previous day – but the small patch of forest between Blackwater Lodge and Ardwell (NJ3529) added delay and distance. It was difficult to tell whether I needed to go up the hill or down the hill to enter the firebreak which would take me directly East through the forest. I ended up going N to the missing bridge at NJ 35706 30205 then picking up the track. Despite an early-ish start I was now running behind my planned schedule but I still found time to call into the tearooms at The Grouse at Ardwell. The Daugh of Corinacy was a slog through bracken and gorse but then I had a supposedly simple 18km mainly on forest tracks to Huntly. Boy, the forest was boring. It went on and on with no opportunity to look at anything but hard tracks, trees and 15mph speed limit signs which were totally ignored by the small number of wind farm vehicles which passed me. It was a relief to eventually emerge from the forest but the weather had now taken a turn for the worst. It was only light rain but it had soaked my shoes and socks. My feet were sore; my back was aching and I had a lump developing on my spine. I was getting fed up and I just wanted the walking to be over. The cloud was very low and – despite being very near to Huntly – I couldn’t see the town. I walked on a bearing up Clashmach Hill. It was good to find the trig pillar as it now meant it was all downhill from here and I couldn’t get lost. Pah! I don’t know what happened but I found myself on the wrong side of a new high fence going Northwest when I should have been going North East-ish. There was no way I could climb the fence; not only did it have two strands of barbed wire but I was absolutely exhausted. I retraced my steps until I found a gate then walked through a narrow path through the prickly gorse until the road to Huntly. I didn’t want to take a single step more than I had to, so booked into a hotel rather than go the extra 1km to the campsite. I then spent half an hour wrapped up in bed trying to warm myself up before I had the strength to have a shower. Tough day. 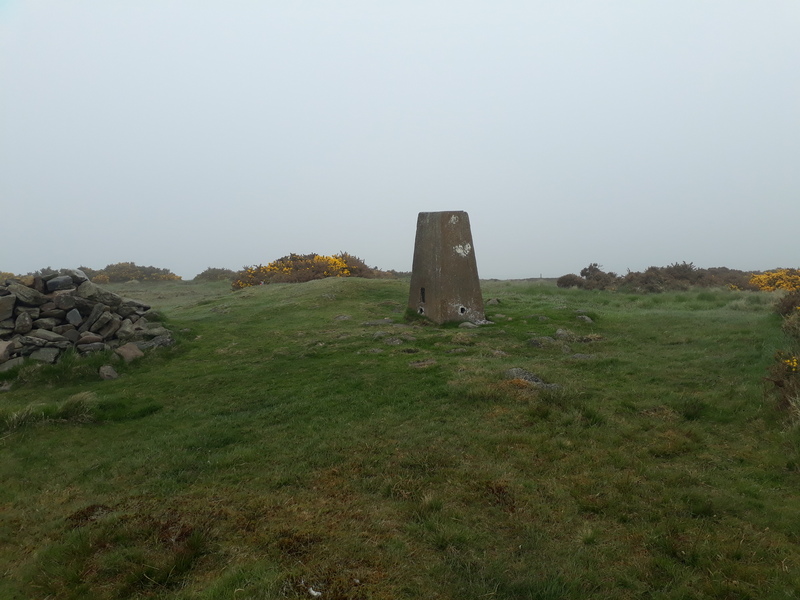 This entry was posted in TGO Challenge and tagged Ardwell, Clashmach Hill, Daugh of Corinacy, Huntly, TGOC2018. Bookmark the permalink. That did sound like a very tough day. Well done you. I’ve never heard of the TGOC before, It’ll be fascinating the follow the rest of your journey. Today’s post sounded incredibly tough, falling into that bed must have been heavenly – even if took ages to warm up. Was the lump on your spine from your kit? Look at http://www.tgochallenge.co.uk if you want to know more. Most people have more fun than my reports suggest! Yes, the lump was from my rucksack because I was slouching due to tiredness. Doesn’t normally happen with that rucksack. Lump went down and did not return when I started walking more upright. Can be an ever decreasing circle once you let your mood drop. Need to stay positive!